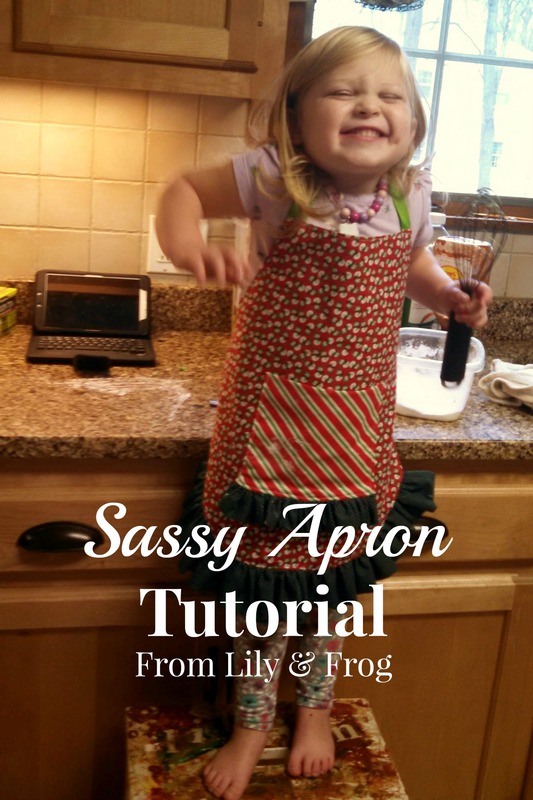 I’m in LOVE with my Sassy Apron design, inspired by The Dating Diva’s Flirty Apron Tutorial… And decided to design a Holiday Apron for our Little Lovely Lily and this coordinating one for myself! 1. 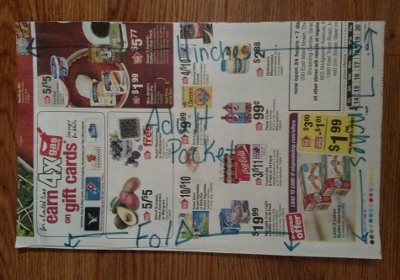 Create your pattern: Using a newspaper create a pattern (LOVE this idea, why didn’t I think of this before?!?). 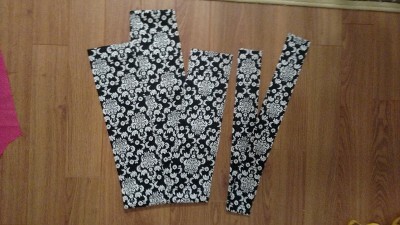 To create the curve for the underarm, I eyeballed a curve I liked but you can also use a T-Shirt arm as a guide. 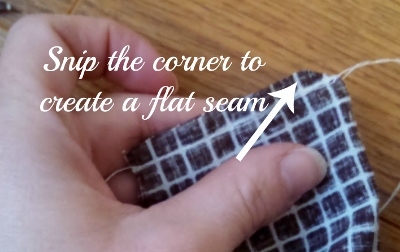 To create the curve for the bottom hem, I suggest flattening the curve at the fold, to achieve a more pleasing looking curve. 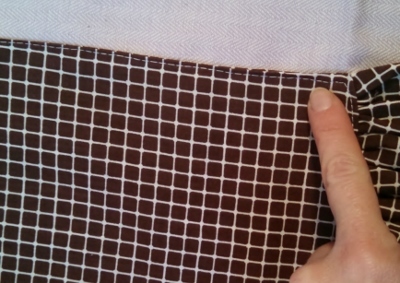 My suggestion for cutting the ruffles, if your fabric isn’t long enough (½ yard is not going to be 1 ½ times the length of the bottom curve), cut several 5in strips and sew them together and repeat this with the 2 ½in stripes as well. 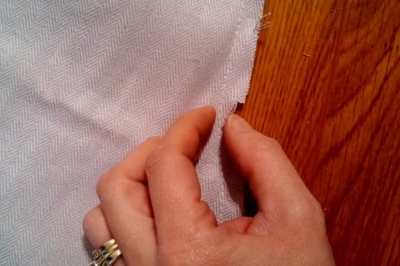 Sewing the Ruffle: Lay the strips flat, folding the Nice Side of the fabric along the long center fold, sew along the short edge, creating a long pocket. 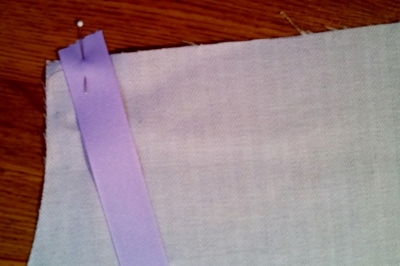 Once sewn, snip the corner to create a flat seam, flip right side out, and iron flat. Repeat this on all 4 ends of the 2 ruffles. 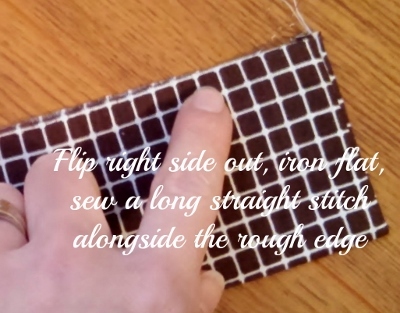 Creating the Ruffle: Beginning along the rough edge, sew a long straight stitch (on a loose stitch setting) alongside the rough edge. 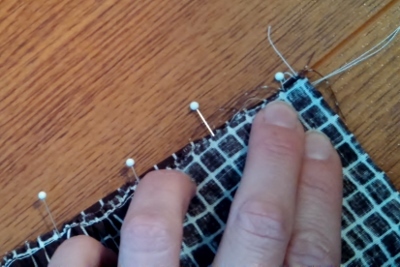 DO NOT back stitch at beginning or end of stitching. Repeat this on both strips of ruffles. 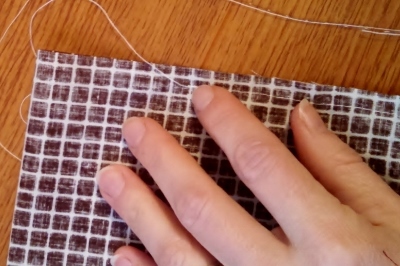 Once the long straight stitch is finished, tie off ONE end of the stitching. 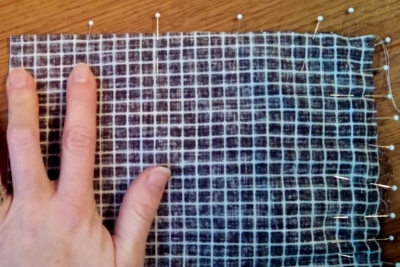 At the other end, determine which the top thread and bottom thread (the top will have a little bump in the stitch vs. the bottom which will be a straight line). Begin gathering the fabric (to create the ruffle) by pulling the BOTTOM thread, as you pull be sure to gather the fabric all the way to the other end of the strip of fabric. Be sure to tie off the end when you have finished gathering and creating the correct length, or it could unravel. 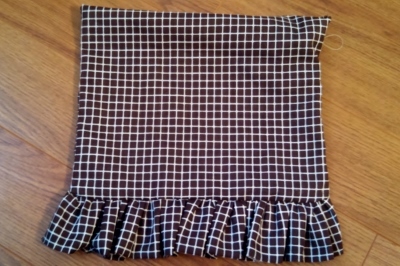 The 5in wide ruffle will be the length of the bottom hem of the apron, the 2 ½in wide ruffle will be the length of the widest part of the pocket (11in). Gathering the ruffle can take a little time, be patient and careful… several times I got a little too confident with pulling and gathering, making it to the end, then with one quick pull and the thread SNAPPED! I needed to start all over again! 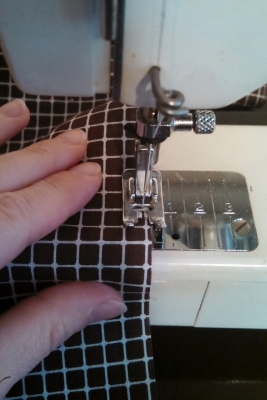 I apologize for not having the correct sewing terms for this part, if you would like the correct terminology and a detailed description I would suggest using this link from Make It Love It. In this link she gives amazing steps and tips for accomplishing what I’m doing… She phrases everything much more eloquently and clearly though, lol. 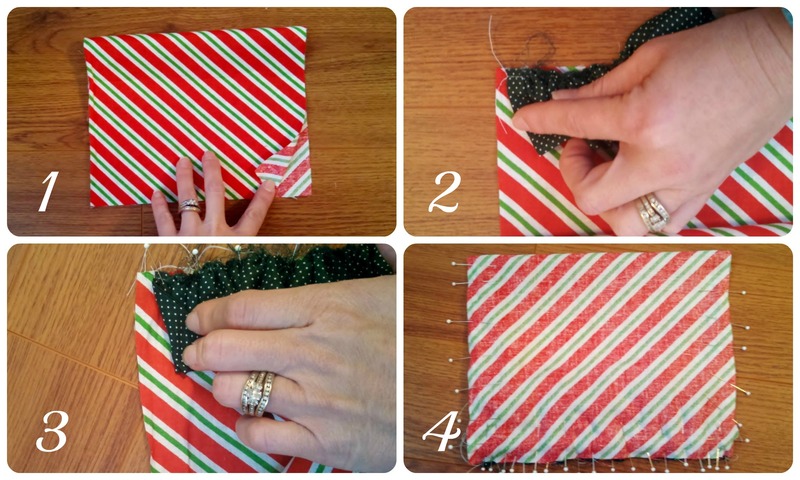 Assembling the Pocket: Fold your pocket in half, Nice Sides of fabric facing one another creating an 11inx7in rectangle, iron it flat. 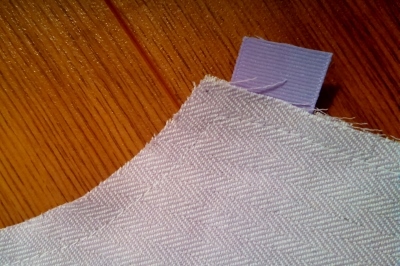 These steps are going to sound awkward – and it is, but it is the best way I could make it work – With the Nice Sides of the pocket fabric facing one another, open the fold. Place the ruffle into position; laying it along the 11in rough edge of the pocket with the ruffle’s rough side facing out and the nice edge of the ruffle facing the fold in the pocket. 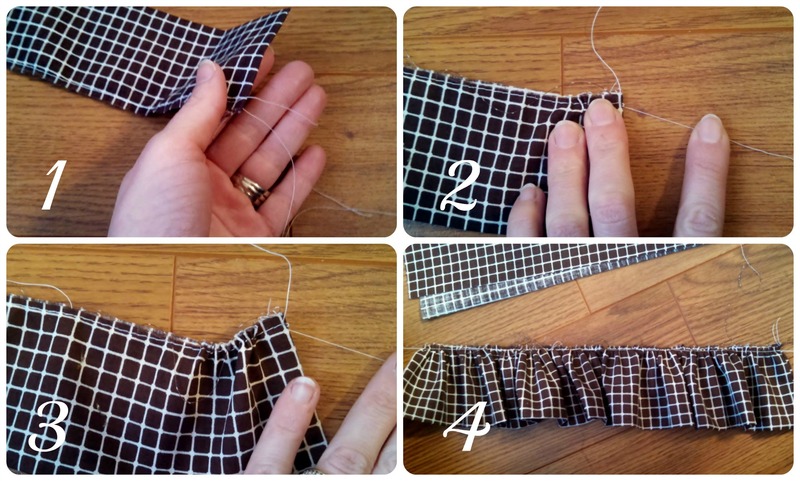 Pin the ruffle into place along the rough of the pocket, making it look pretty as you go. TIP #1: The edge of the ruffle along the outside edge of the pocket; scoot it in the wide of your seam allowance, this will ensure you will not sew the ruffle to the outside of the pocket (I sewed the edge of the rubble to the edge of the pocket a few times without knowing it until I flipped it right-side out. 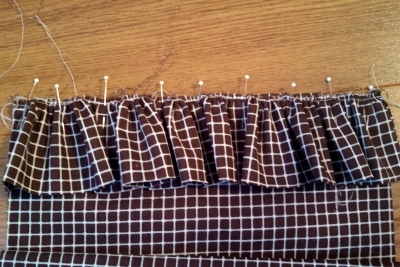 TIP #2: The best way for me to accomplish an even ruffle was to pin each end down, then flatten the ruffle slightly, and move to the center pinning into place. Then flatten again pinning center of each opening created by pinning and so on. Fold the pocket closed, beginning pinning along the ruffle edge. 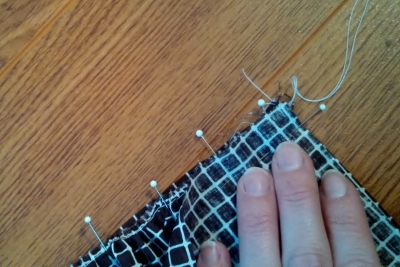 TIP #3: Do not pin along the sides of the pocket yet. Pin in between the pins already in place with the ruffle, once finished, stick your hand inside the pocket, pulling the ruffle taught (preventing the ruffle from folding onto itself and looking goofy, lol). Pin all three edges closed. 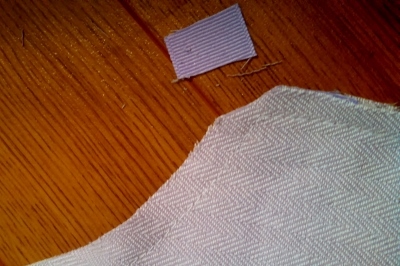 Sewing the Pocket: Sew along 3 edges, leaving an opening to flip is right side out (an opening about the width of 3-4 fingers). 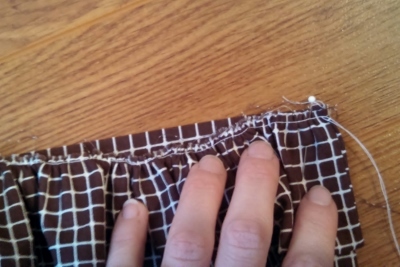 DO NOT sew along the folded edge of the pocket. Flip the pocket right side out, pulling the ruffle taught and flat. Iron the pocket flat, and making it look pretty. 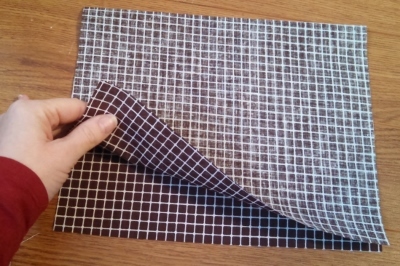 Grab your Apron fabric, which is already cut in the shape of the apron. 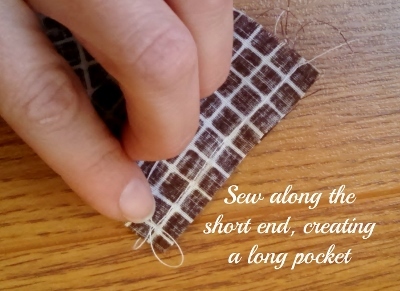 Place your pocket where you would like it, pin it, and sew it into place along the two outside edges and bottom edge of the pocket. 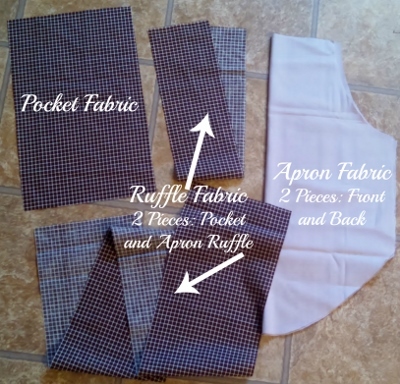 If you would like 2 openings for the pocket, stitch where you would like this pocket. 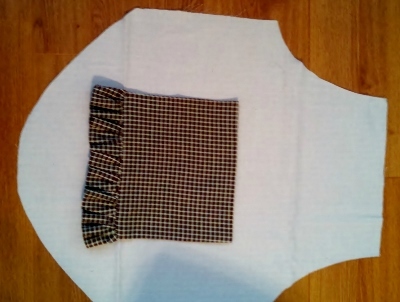 Assembling the Apron: Grab your pieces: long ruffle, apron front (the one with the pocket sewn into place), apron back, 2 neck ties and 2 behind the back ties. Pin into place the ties. 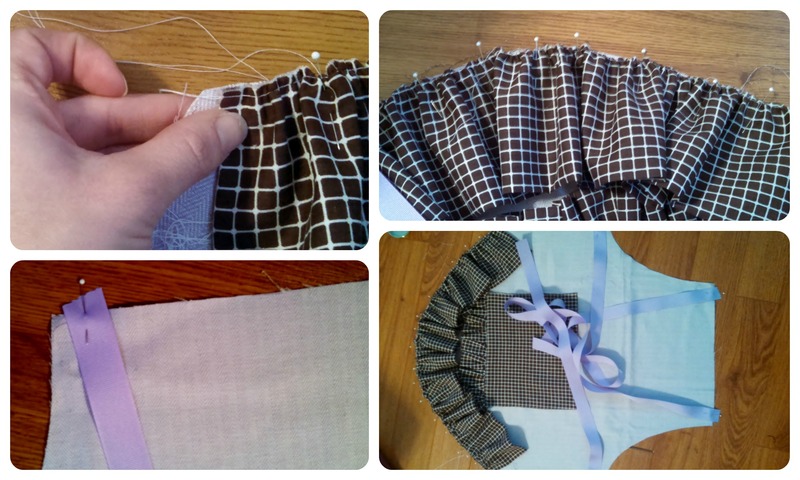 Using the instructions above for pinning the pocket ruffle; pin the long ruffle into place along the bottom curve of the apron with the pocket. 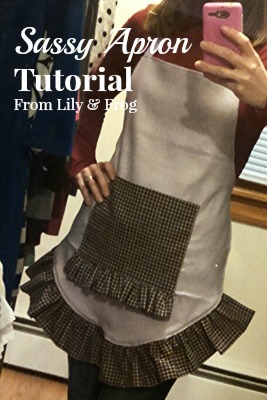 Using the instructions above for pinning the pocket sides together; pin the apron back to apron front along all edges (the ruffle and the ties as well). 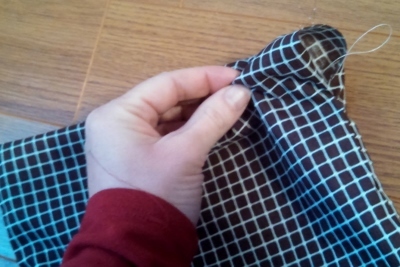 Sewing the Apron: Sew along all outside edges of the apron leaving an opening to flip is right side out (an opening about the width of 3-4 fingers). 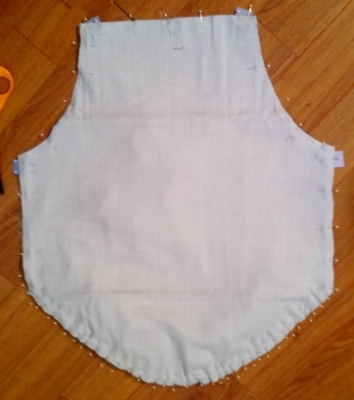 Snip the corners to create flat corners when flipped right side out and snip along the bottom curve and arm curves creating slight darts when the apron is flipped right side out is will help flatten the apron properly. 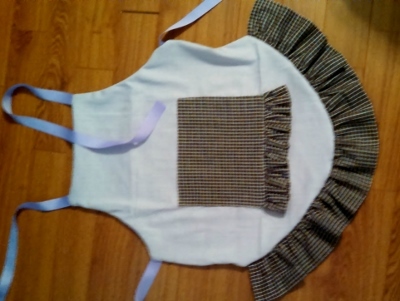 Flip the apron right side out, pulling the ruffle taught and flat. Iron the apron flat and making it look pretty. 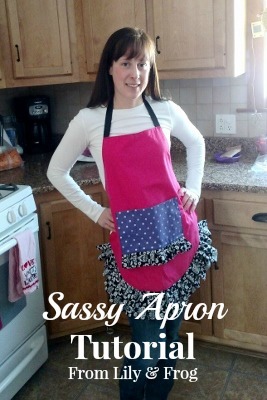 You have a little opening in this apron (where you flipped right side out), to make it disappear once the apron is ironed flat, sew along the outside edge of the apron… It also looks SUPER cute with this little detail. Heat seal the ends of the neck and back ties. 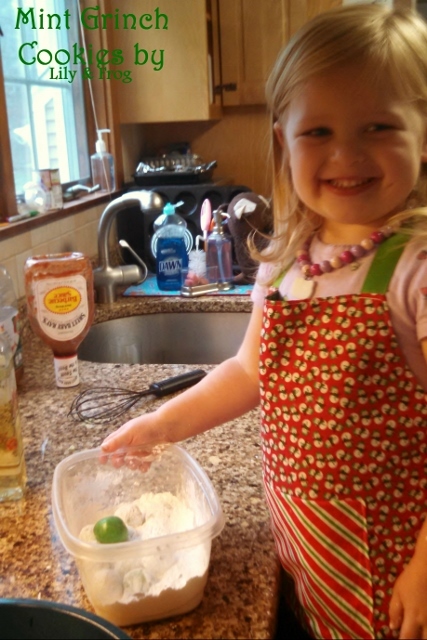 How about a Mini Size one for your Baking Assistant?!? Just adjust the sizing and your all set! Do you have any questions? Did I miss a step? Is a step confusing? 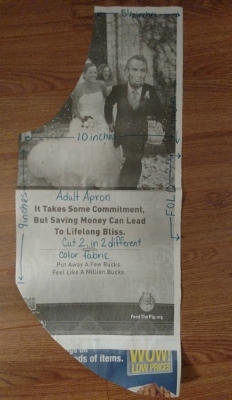 Did you design your own apron from my instructions? Please leave me a comment below, I would LOVE to hear from you! Categories: Christmas, L & F Products, L & F Services & Products, Uncategorized | Permalink. 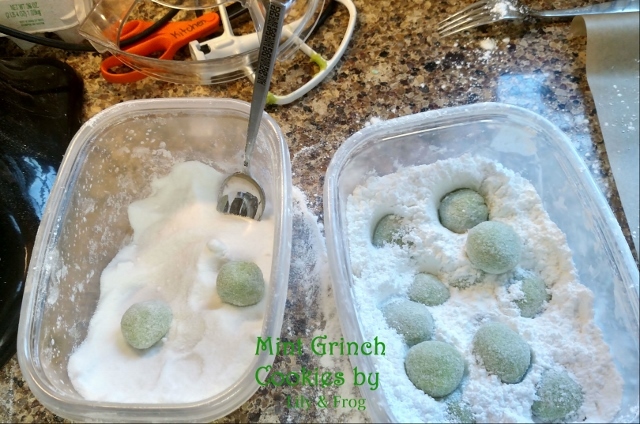 I LOVE discovering NEW cookies recipes for the holidays and these Grinch Cookies from In Katrina’s Kitchen are absolutely delicious AND super easy to bake. 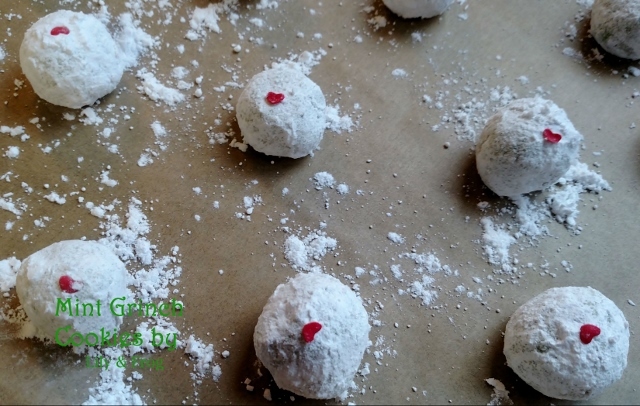 After I learned more about Cake Mix Cookies, I made a few alterations to In Katrina’s Kitchen’s recipe to suite my family’s holly, jolly, merry sweet teeth. 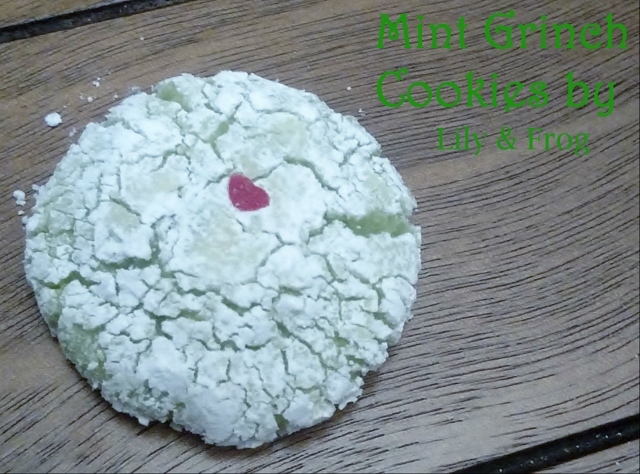 Below is my version of Mint Grinch Cookies, inspired by In Katrina’s Kitchen’s Grinch Cookies Recipe. I hope you enjoy them as much as my family does! 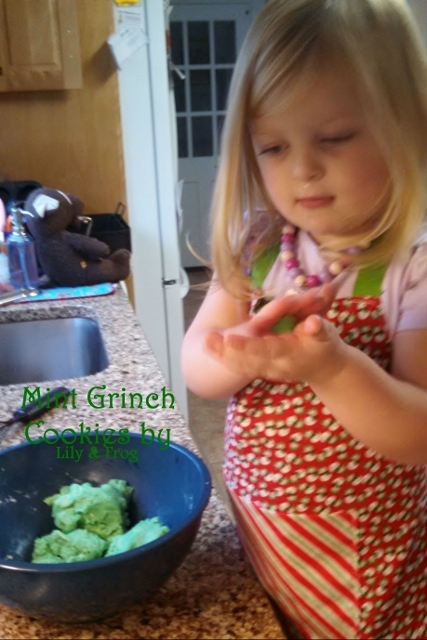 Lily LOVES to bake Mint Grinch Cookies in her Holly, Jolly Holiday Apron! Prepare the cookie batter as directed in my Cookies from Cake Mix instructions… Mixing together the cake mix, vegetable oil, and eggs. 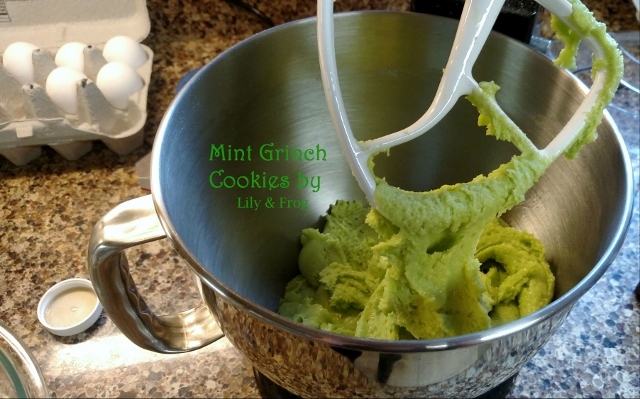 Add 2-3 drops of mint for taste… I LOVE a mint cookie, the Grinch Green made me think of mint right away, this is why I added the mint. You are more than welcome to omit the mint though. Press heart shaped sprinkles into place on the green cookies. Bake cookies for 7 minutes (as directed in Cookies from a Cake Mix). Cover all your cookie sheets in parchment paper before laying out cookies… Your clean up time will be a fraction of what it used to be and the cookies will slip right off! Do not bake them too far in advance, 1-2 days is just enough. If you bake them more than 2 days in advance the oils from the cookie start eating up the confectioners sugar and they get mushy looking. Purchase your Heart Sprinkles in February! Searching for Heart Sprinkles in the grocery store or crafting store in December is NOT fun. 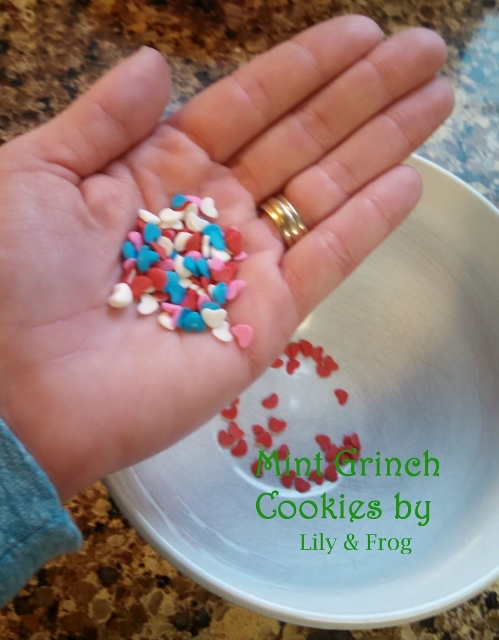 I happened to stumble upon left over multi colored Valentine’s Day Heart Sprinkles and I was stuck separating mini heart sprinkles! 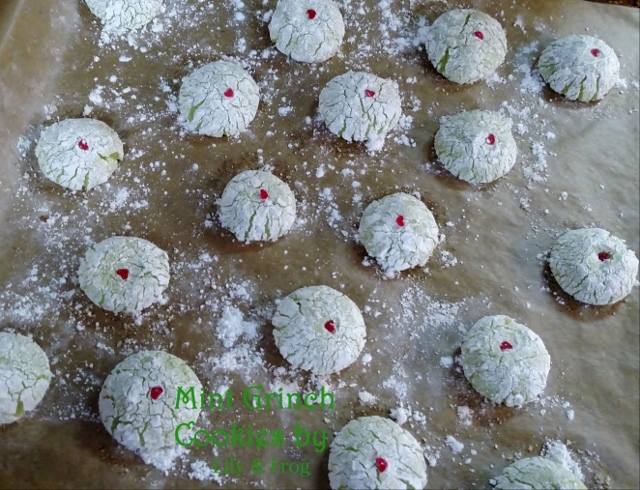 I prefer a Crackle Cookie-Look over a dusting of confectioner’s sugar on a cookie… using the process of rolling in sugar, followed by confectioner’s sugar is the best technique I have attempted thus far to create a festive Crackle Cookie-Look for my Mint Grinch Cookies. Please let me know if you try these cookies out for yourself… I would LOVE to hear about them. If you make alterations/changes let me know and I’ll try them out… Who doesn’t love a Cookie Taste Testing Kinda-Day?!? 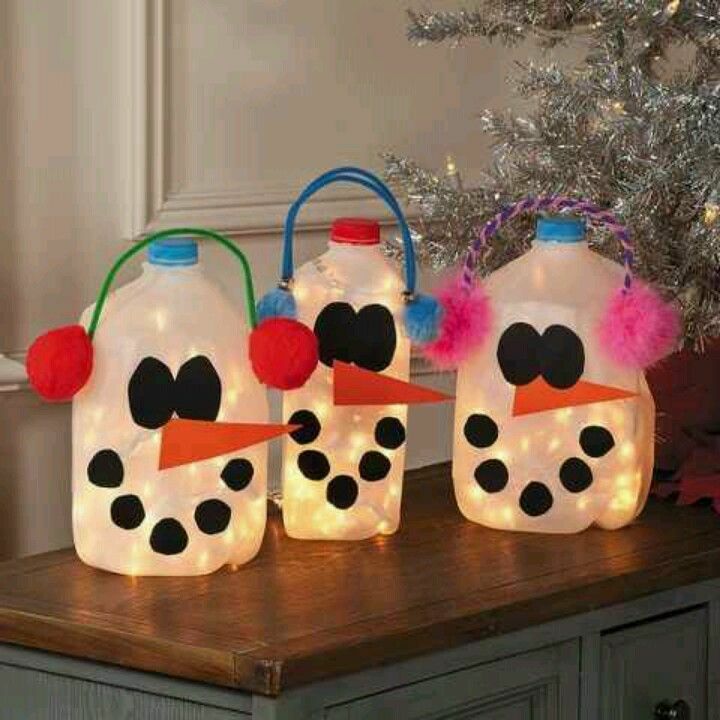 Categories: Christmas, Crafts & Projects, Kid's Activities, Party planning | Permalink. I have found 5 (ok 6, I couldn’t help myself, lol) Holly Jolly Christmas Cocktail which look delicious! Categories: Christmas | Tags: christmas, Cocktails | Permalink. Hand over a plate of Christmas Cookie and they are going to be gobbled up in about 15 minutes, OK they will be gone in 10. I’m envisioning baking all of these cookies, while building a Gingerbread house, dripping in chocolate, with melted snowmen in the front yard, all while drinking Hot Chocolate AND watching the Grinch Who Stole Christmas. I think I got them all! Chocolaty Melting Snowman – This one looks like it could be work, but I’m dying to try these out. 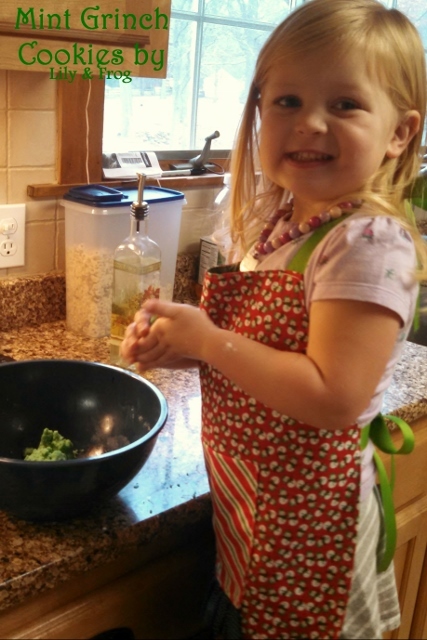 Do you have a Go-To Cookie Swap Recipe?? I would LOVE to try it out, post it below! 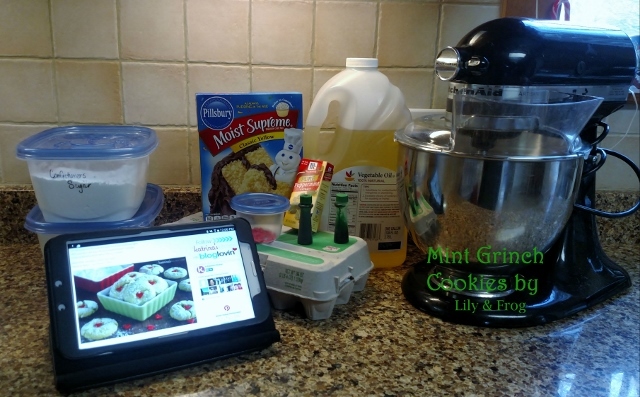 Categories: Christmas | Tags: christmas, cookies, dessert, recipes | Permalink. As soon as I started searching for cookies for a Cookie Swap I’m going to tomorrow, I was incredibility overwhelmed!! I knew there were oodles and oodles of Christmas Cookie recipes, but I NEVER knew there were that many. Then when I searched Hershey Kiss cookies I was flabbergasted by the number of creative and scrumptious cookies… There are more flavors of Hershey Kisses than I could have imagined. I’m a huge fan of arts n’ crafts for the kids… But when I have to purchase a million and ONE different supplies for an arts n’ crafts session, I get a little flustered. For this weeks Lily & Frog Friday 5, I collected 5 easy toddler Christmas arts n’ crafts which appear to be uber EASY, wicked simple, re-using items which I would have thrown away, and supplies I already have in the house! Plus, I do not foresee a mess with these crafts… There is no paint! Categories: Christmas, Crafts & Projects, Kid's Activities | Tags: christmas, Kid's Activities | Permalink. I LOVE an original, imaginative, and playful Elf on the Shelf idea just as much as the next Parent… But, when it comes to Elf on the Shelf, I have Z-E-R-O creativeness! They are messy little Elves… All I want is a tidy little Elf, is that so much to ask for?!? A pool of marshmallows, ripping apart a tissue box, a snow ball fight, snow angles in sugar… I can not take the MESS. Plus, if you follow the ‘Rules’ the kids can’t touch the Elf, so I can’t either, which means that MESS will be there ALL day long, staring at me ALL DAY long, driving me bonkers ALL DAY LONG! Our Elf doesn’t know our babies can’t read yet… My babies can not read yet! Need I say more? Our Elf is banned from writing letters to Santa or leaving mysterious (sometimes creepy) messages for Zach and Lily on the bathroom mirror. 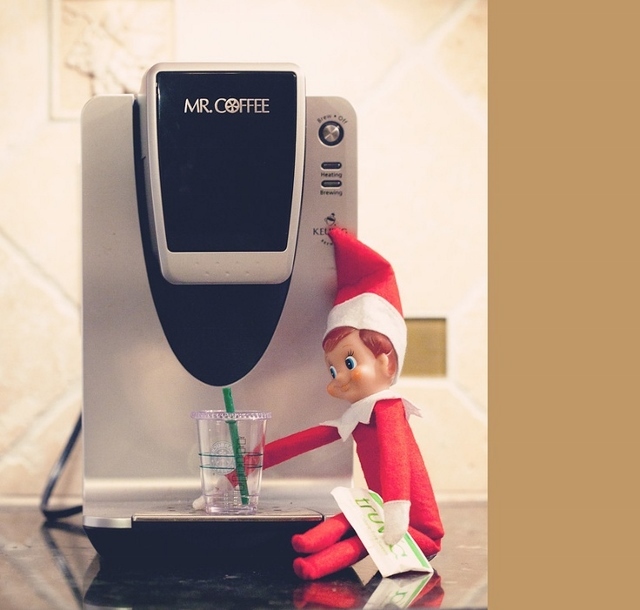 Our Elf has mastered the fine art of camouflage… Seriously! Our Elf can remain unseen (from ALL of us) for up to a whole afternoon, and through no fault of the kids either… It is because Mom & Dad were not paying attention when they helped the Elf find it’s new location and completely forgot! Are there Elf on the Shelf Search Parties we can hire?!? Our Elf is sleepy… Sometimes, our Elf falls a sleep early on the couch or reading a book and ‘forgets’ to move to a new location. Which means Mom & Dad need to cover for him pronto (we are cool parents like that)! We need to race down the stairs, dodging kids, dogs, blankets, and stuffed animals to hunt down the camouflaged Elf (see #3) before our 2 peanuts discover him in the SAME location as before. Our Elf enjoys looking down… The number one rule of Elf on the Shelf is the kids can’t touch him, or else… Blah, Blah, Blah… Basically, you are lighting up arrows with bright Christmas lights alerting my kids to invite the Elf for a tea party. This is why our Elf is ALWAYS off the floor, off the counters, or climbing the walls, hanging from the chandelier, or propped in the Christmas tree… The kids can not kidnap him for a Monster Truck Rally!! SIDE NOTE: Now that I have the idea for Magic Elf Dust from Sweet CS Design, I’m all set. Categories: Christmas, Crafts & Projects | Tags: christmas, Elizabeth | Permalink.